Caption slip reads: "Photographer: Wyman. Date: 1958-01-06. Reporter: Farrell. Assignment: Lovers shooting, Hollywood. 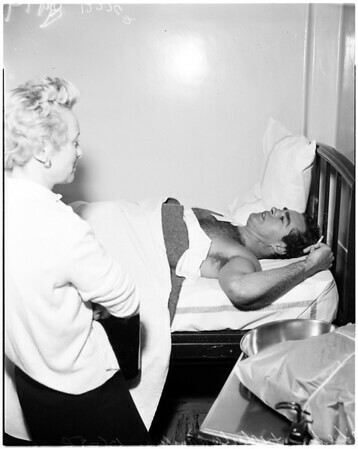 8-19-70: L/R: Charles Quinlivan -- 33 (shot by her husband) and Lee Sargent. 20: Hendry Sargent (did shooting) and ambulance attendant Jim Thorp. 69: Hendry Sargent (victim) and ambulance attendants L/R: Jim Thorp and Mel Shoene".